WASAA (Western Alliance for Scientific Actions with Australia) is a consortium of French higher education institutions in Western France interested in establishing partnerships with higher education institutions in South Australia. 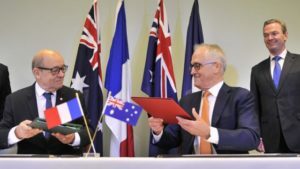 The cooperation is based on the inter-governmental agreement signed on 20 December 2016 in Adelaide between Australian Prime Minister Malcolm Turnbull and the French Defense Minister Jean-Yves Le Drian. WASAA’s objective is to strengthen research partnerships between signatory institutions and encourage student exchanges between France and Australia.